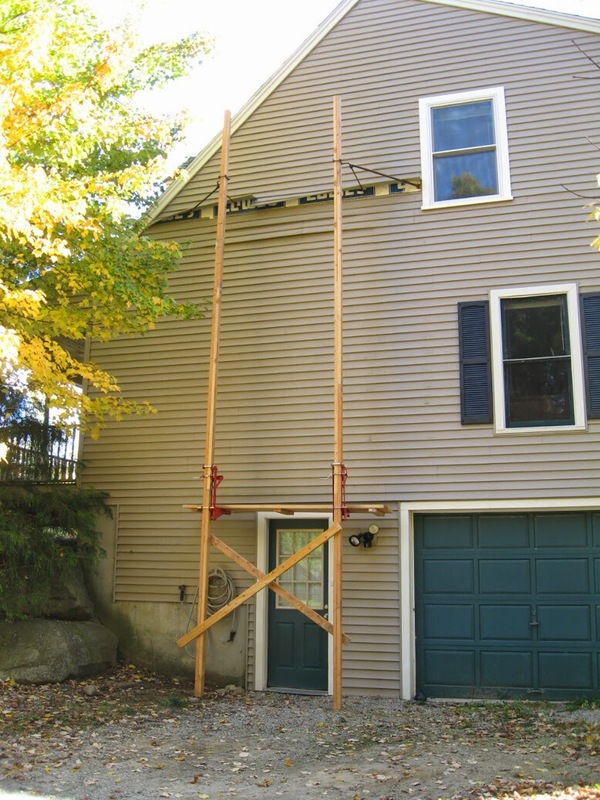 While we had gotten the new window in a while ago, we were waiting for our rough-in inspection to pass before we could put the siding back on. 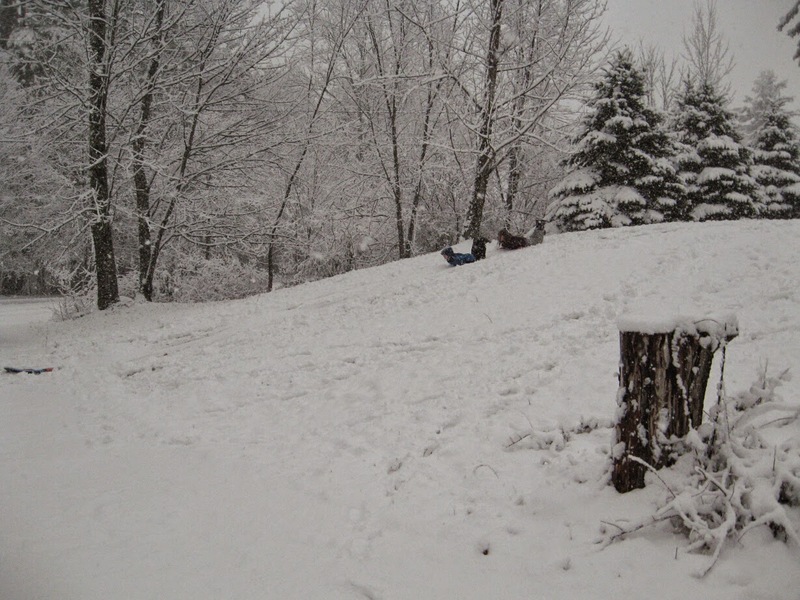 I was starting to get really, really nervous with the prospect of having a blanket of snow come before we had finished. Last winter, we didn't make it, and one side of our house (near our mulled window in our bedroom) was un-sided for the whole winter. While it turned out fine, and we did finish that this spring, I didn't want a repeat this year. October 15th... Plenty of time. 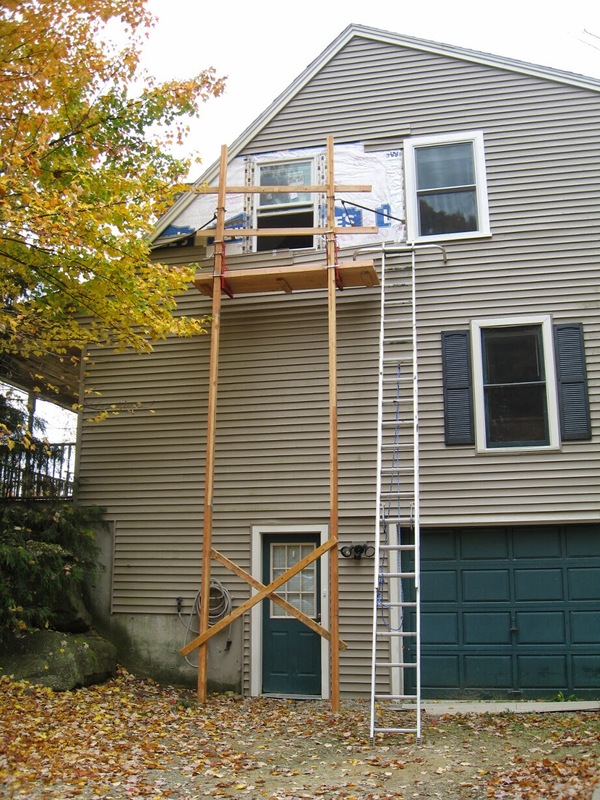 Needless to say, I've been itching to get our siding back on since our rough-in inspection passed last Thursday... but the weather was not cooperating. After quick glance at the weather last Friday, and I decided to add Tuesday and Wednesday to my days off this week. They were [supposed to be] very warm with no rain in sight. We could easily get everything done in two days, and if not, no sweat... the rest of the week looked fine. Come Monday and the forecast didn't looks as great as it had. Tuesday still looked great, high 60° and clear. Wednesday high 40° and rain. Wednesday night, we had our first winter storm warning - 6" snow. So Tuesday was it, with a rainy buffer on Wednesday. 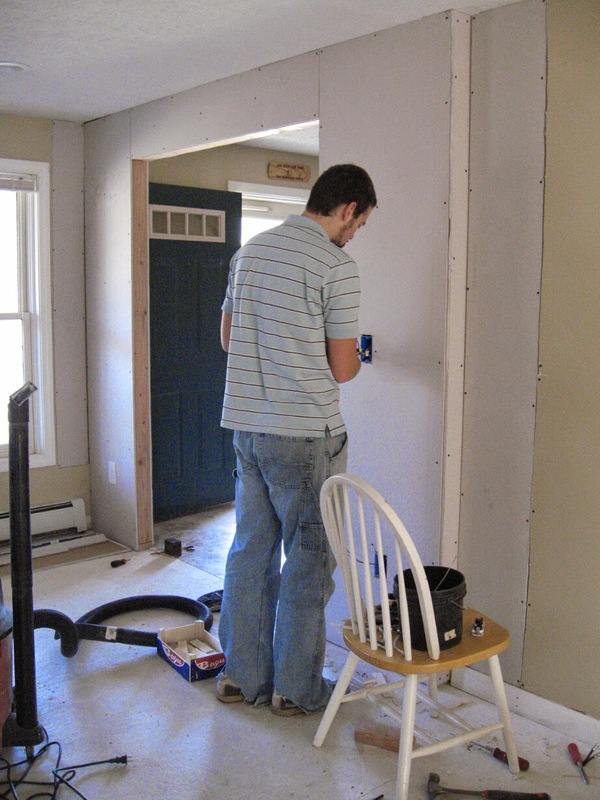 Jon got most of the siding up by himself while I made the window frame. 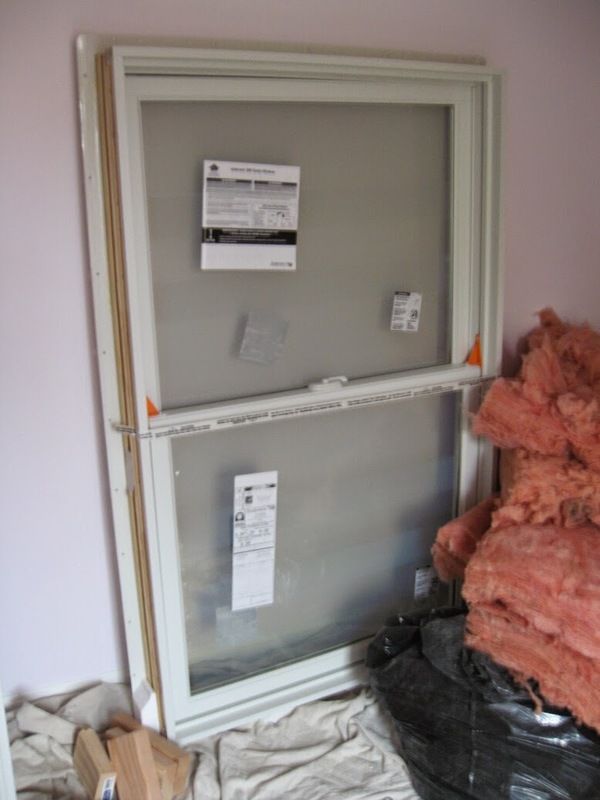 The frame is made of PVC, just like the other windows we've installed. We used a trim from the stealth line from Versitex. 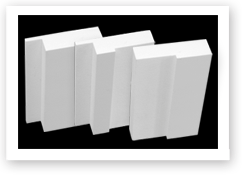 we picked the middle profile in the image below. It has opening for the window flange on one side and one side and d something like an integrated 'j-channel' on the other. Personally, I think it really cleans up the way vinyl siding looks around a window, as can be seen in the two comparison pictures below. 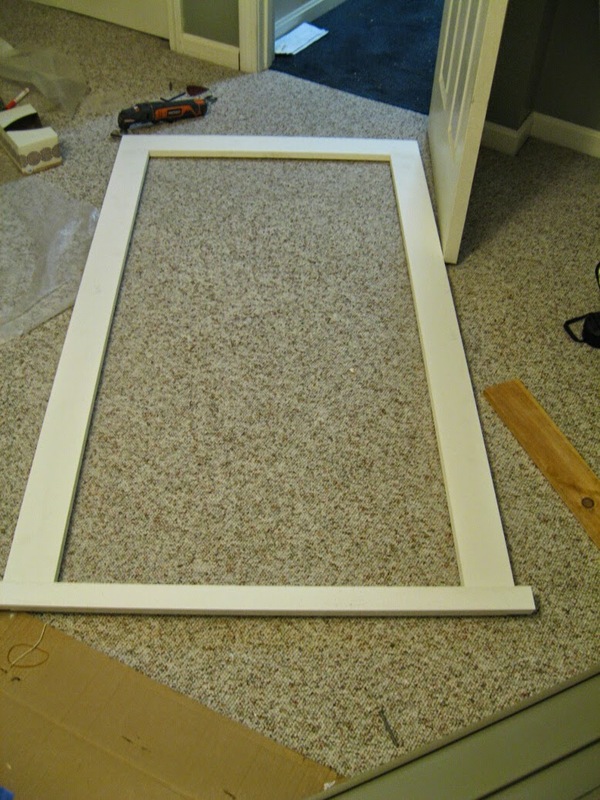 However, framing the window trim does require a little more work than, say, a picture frame would, and it did cost a little more. 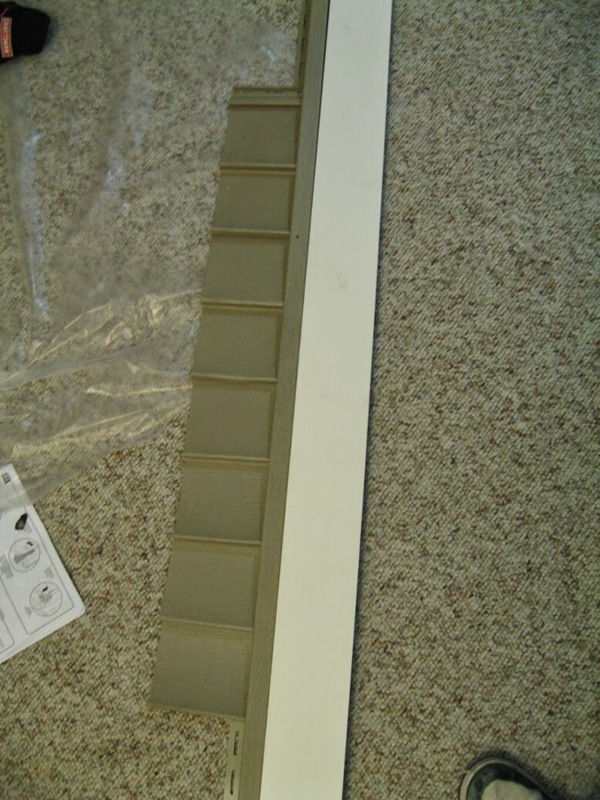 Not much more than using regular Versitex PVC trim, though. I think it's totally worth it. 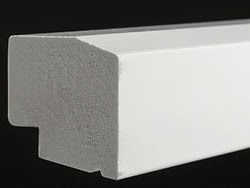 I used the historic sill, at the bottom , also PVC by Versitex. Like the other windows, I beveled the side edges to match the front. Again, a bit of time consuming detail, but I think it looks much nicer that way. I did prepaint the siding for all other other frames... but I skipped that for this one. Next year, I'll paint it. It's just for protection anyway, it's very close to the same white the PVC came in. Actually the frame from the boy's room. Nearly identical though. 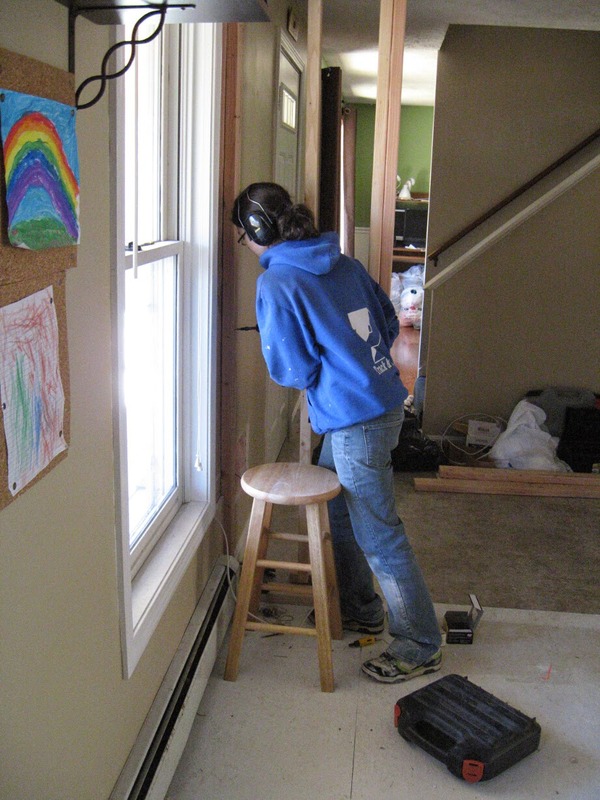 Once the siding was on, and my trim was done, we went around a caulked and filled in the screw holes on the trim... And then we did that to two of other windows that we installed last year and hadn't done yet. All running around to try to get the caulk in before it dropped below 40°F... which wasn't supposed to happen until 12PM... but the caulk is supposed to have 24 hours to cure. 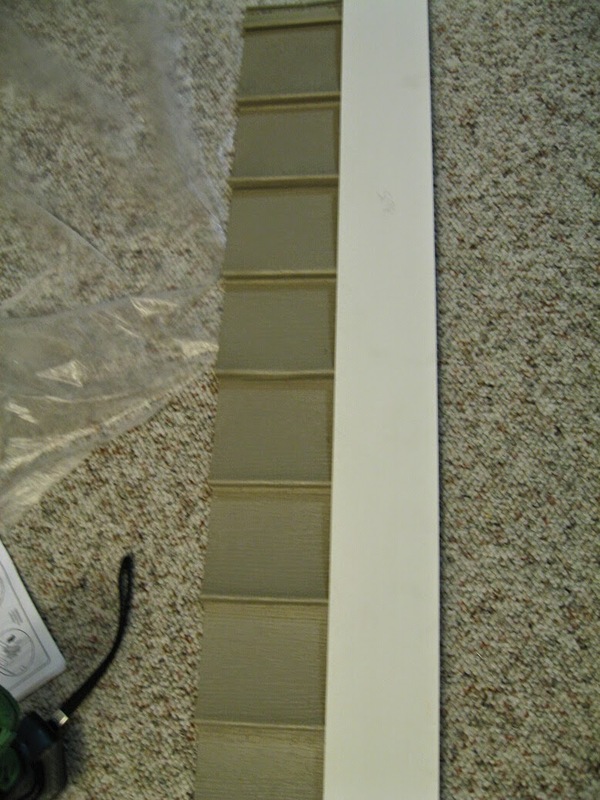 We'd had some trouble with the typical 35 year DAP caulk on another window, so we used silicone this time. We'll see how it goes, I guess. Once that was all done and we had dinner, it was dark and around 8PM..... and we still had to get the pump jacks down. One of the poles had gotten pretty worn, and we did have some trouble getting one side down. Still a few hours later Jon and I had managed getting the jacks and platform off, and poles down, and the last pieces of siding that was off (for the pump jack stands) was put back on. We decided it was time for the poles to be retired, since they were getting worn, and we don't have an immediate plans for them in the future (can I get a whoo-hoo?)... so we chopped them up and brought them in the house. 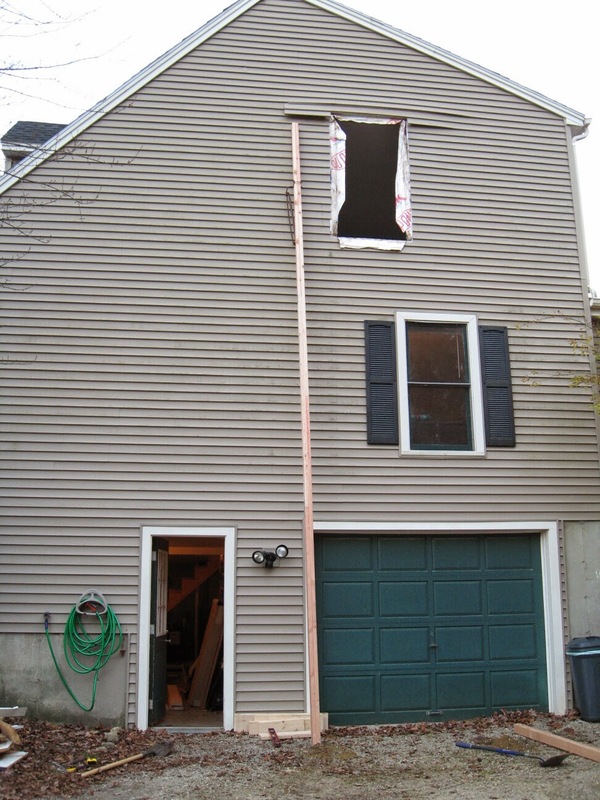 We fixed some other siding issues we had noticed, and then called it a night. It was a wonderful feeling. 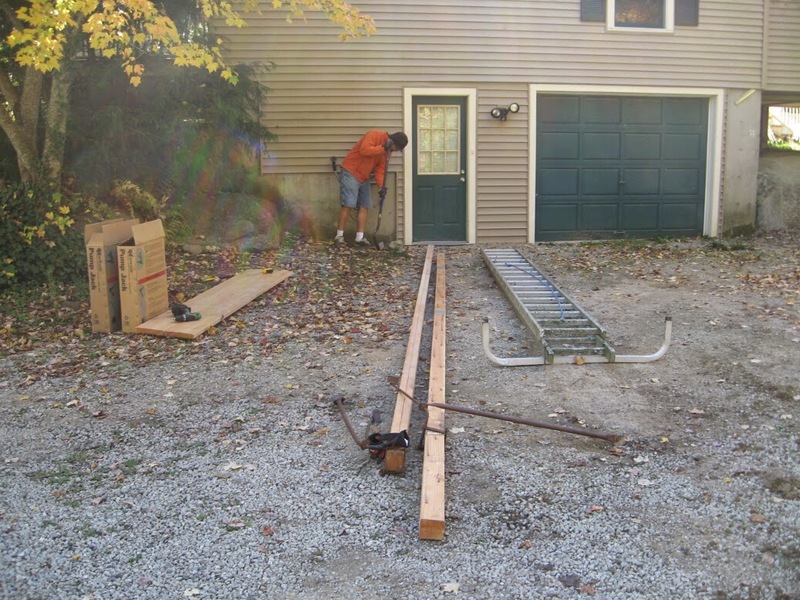 We worked hard, and I was cold and tired, but our house was all set for winter. Added bonus, my kitchen looked better than it had in months. My Mom even took out the trash, recycling, swept everywhere, did every dish and cleaned the stove top until it was sparkling. I didn't even want to leave the kitchen, so I sat there enjoyed some hot cocoa and checked my email... which contained another weather advisory. Now the storm was to start at 10AM, with more snow predicted. I feel so relieved. 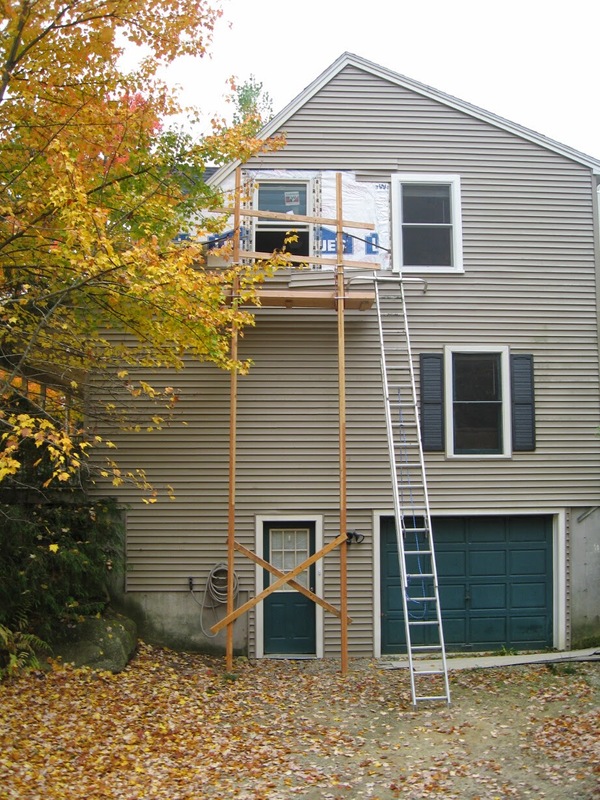 Just for fun, here's the progression of that side of the house. 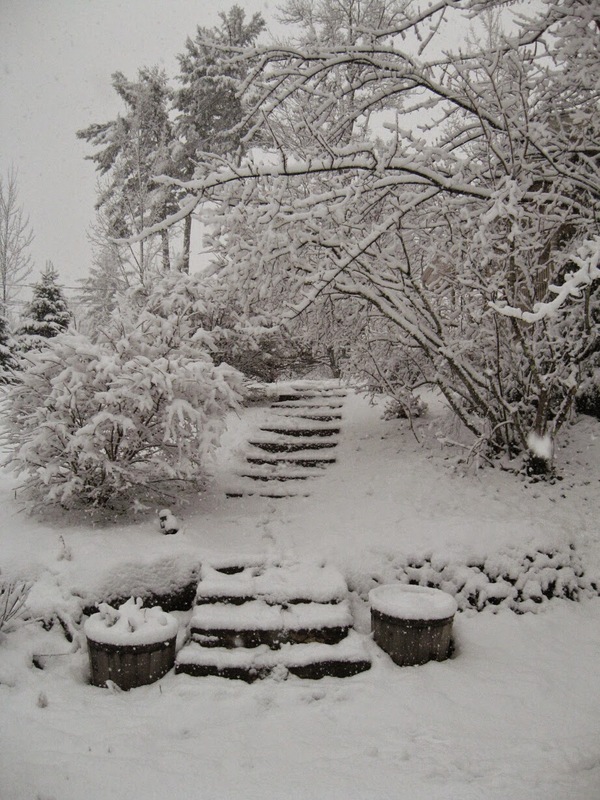 I snapped this picture at 10 this morning, when I went out to collect our garden pots to put the shed (and get all the shovels). Such a pretty new window.... And I'm so glad being on a ladder 20 feet up isn't in my near future anymore. But here's the real kicker. This is just 30 minutes after that last picture. And then 2 hours after that. Boy did we cut it close. Happy Thanksgiving! Enjoy your snow! 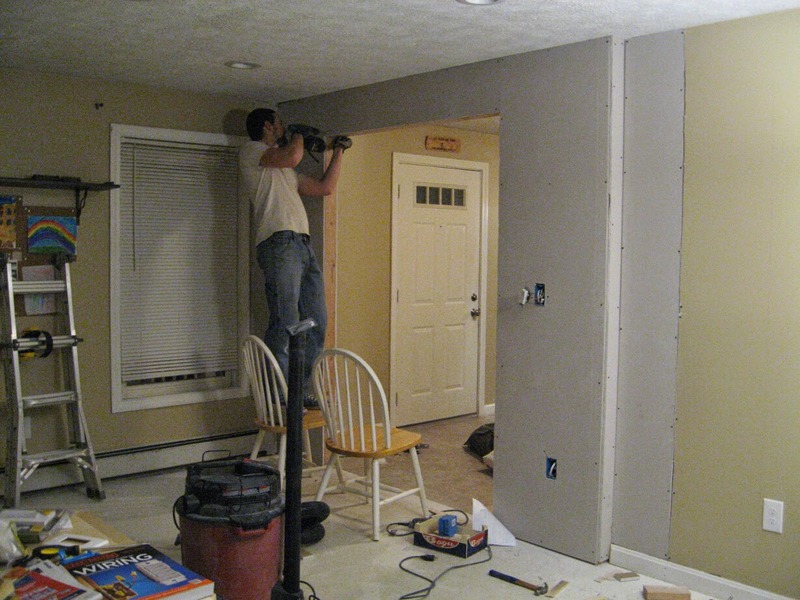 We were super excited to pass the rough in inspection, not just because it meant we didn't have to redo any electrical work, but because it meant we could finally put drywall up...and maybe have power in our house again. 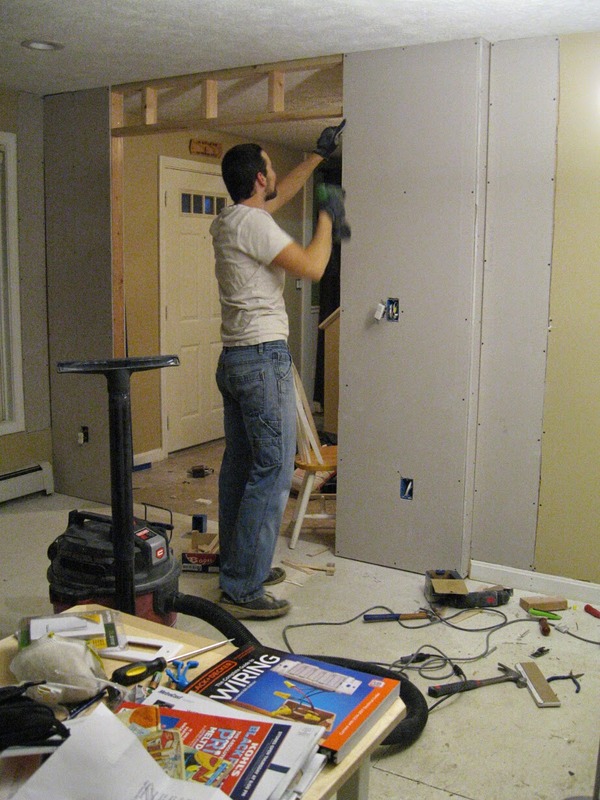 We we able to get all of the downstairs drywall and some of the upstairs drywall done in one Saturday. 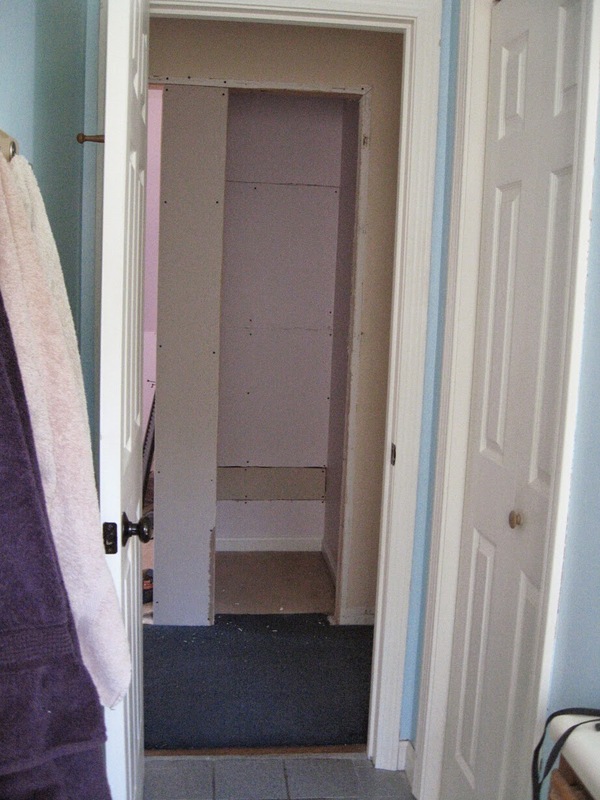 Before we started dry-walling though, we made a last minute upgrade, and put in one extra outlet under the light switch. It's seemed necessary since we're viewing this as a separate office now. Once the wall was filled in, it matched our vision perfectly. Just a little something to pull back some of that awkward floor space that was left unusable, but still trying to keep the layout open. 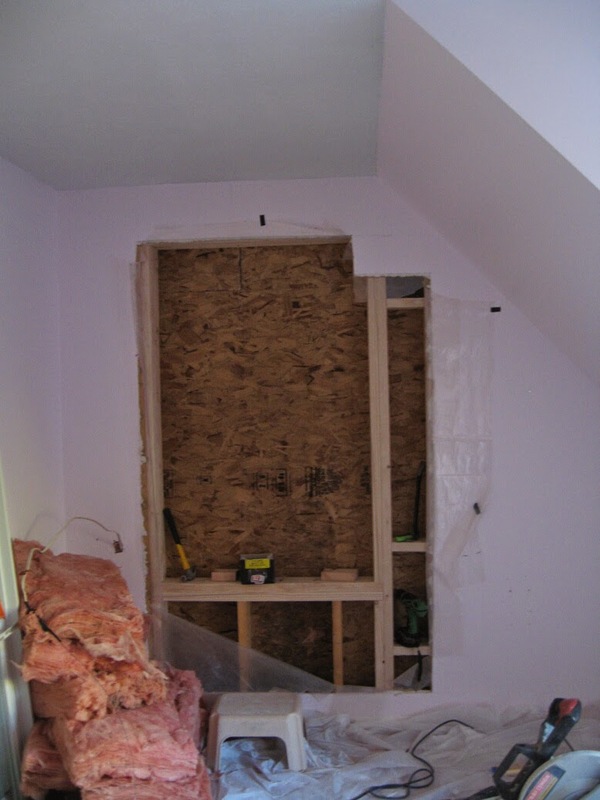 And here it is now... We knew we wanted the walls to expand the more mudroom wall space and framing out an area for built in coat storage. We also knew that closing it off would make the entry feel smaller.... and it did. Tons Smaller. With time, we expected to get used to it... but boy does it feel unsettling to make a change, and just go.. ehhh... we sure we like this? 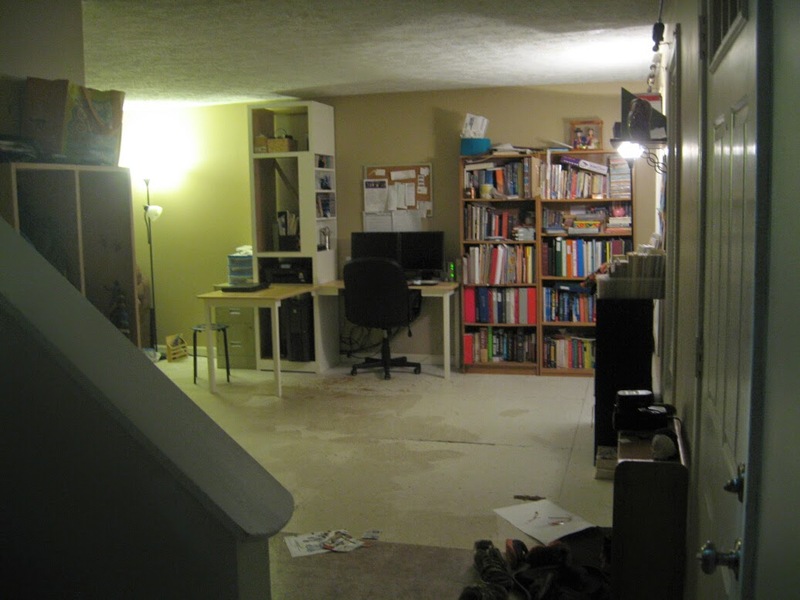 Here's a side by side showing the loss of our lovely open concept. 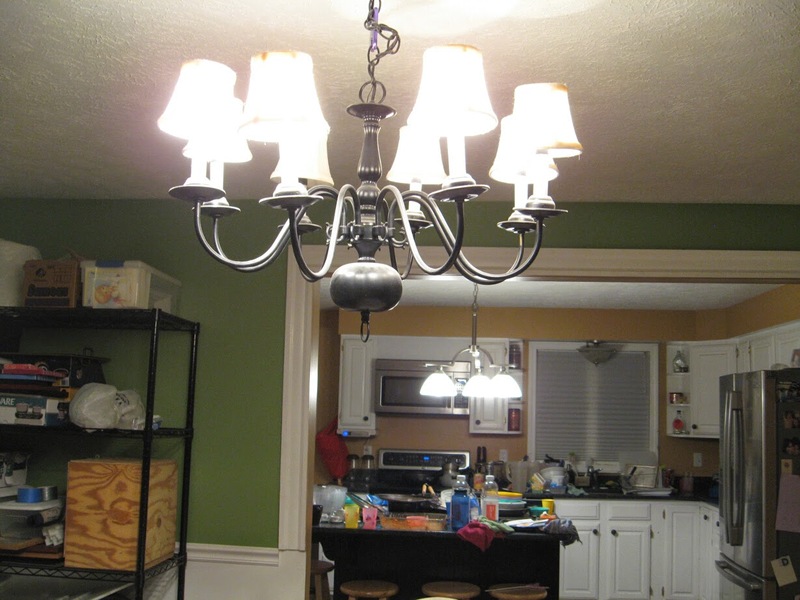 One thing that Jon pointed out was that the light fixture in the entry seemed a little off center in now... Which actually reminded me - Someday, when we put in our real, hardwood floors, we'll be redoing the stair railing to have balusters... which will both make the room feel bigger and the make that light more centered (it's center of the room, including the stairs). That should help some. 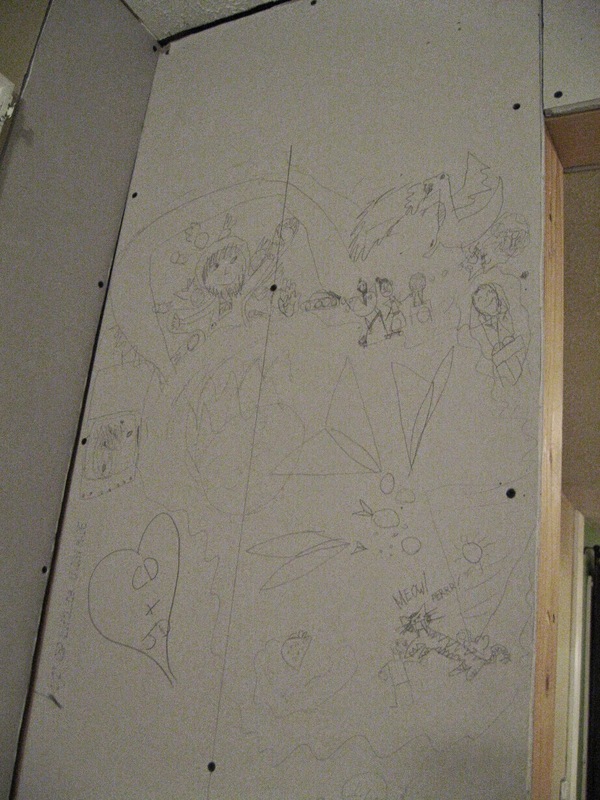 Once all the drywall was up, we let our kids have a field day drawing all over it. We're strict on coloring on the walls (apartment dwellers for 8 years! ), it was nice to let up a bit. 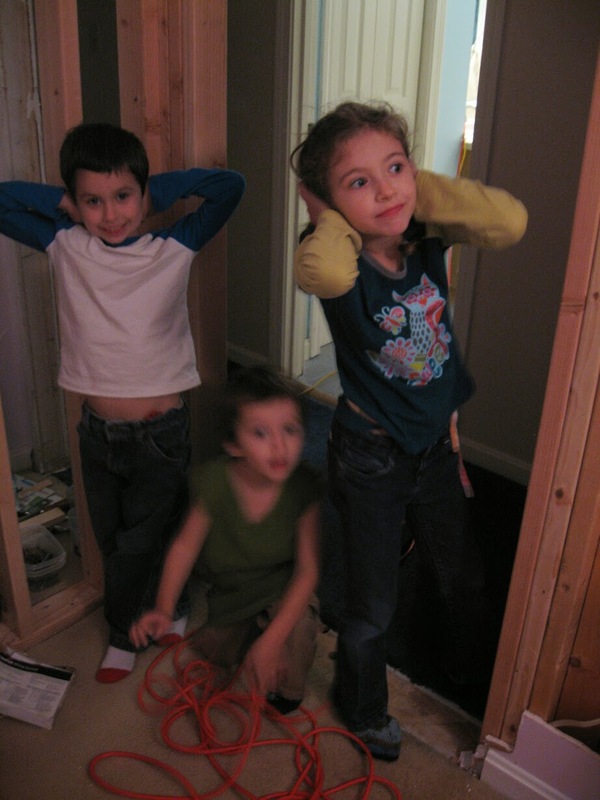 Upstairs, we got the closet all framed in, but wasn't able to finish up Eve's room. Still, feels like great progress! ...Sounds like an album name, doesn't it? Sure it does. Right. Anyway. 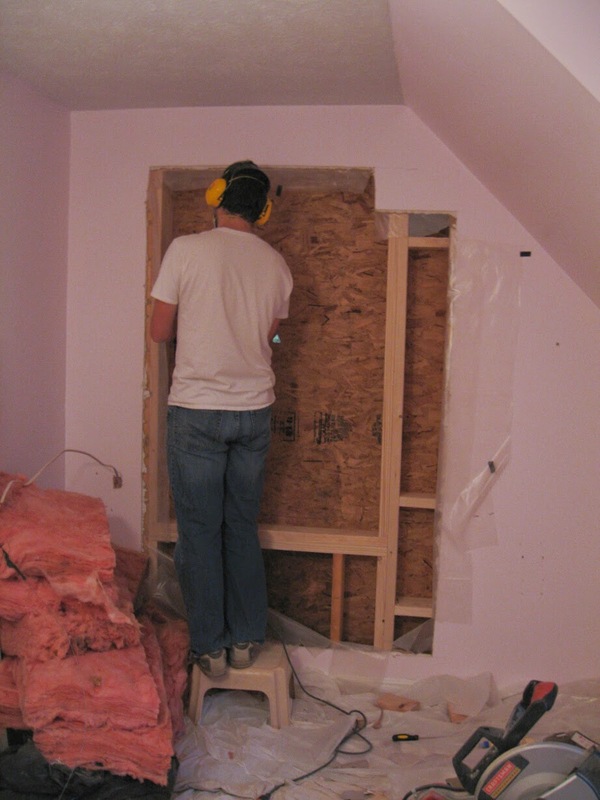 So, there has a big big long gap between framing the closet, moving the door, and getting the new window in. And there's sort of a good reason. 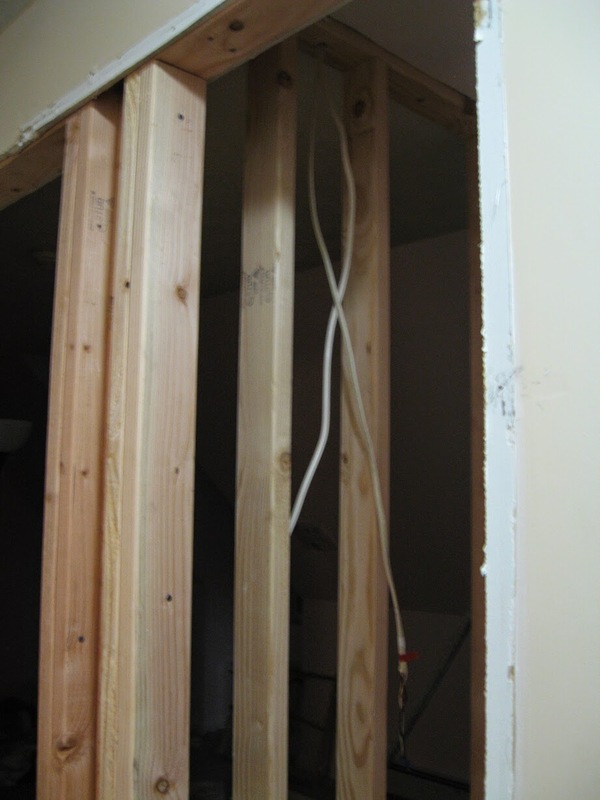 Halfway though the demo, we realized we needed an electrical permit, because we would be moving outlets as well. We called to confirm, and yes, we were supposed to have them. 14-2G wires. I got to see a lot of these. This actually changed our direction a little bit. ... and we've actually added on a fair amount of electrical work to our other plans. That's the big reason why this 'simple' project isn't done yet, and why I haven't had any time to post... electrical work is time consuming! Plus having the power off in the living room where our computer lives isn't helpful either. 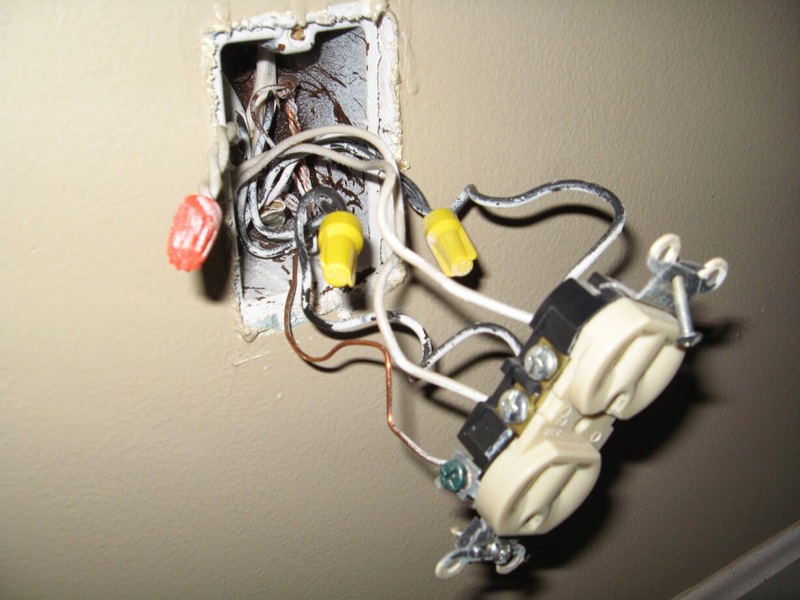 Replace and fix the dimmer switch in dining room (one switch was switching the other switch, not the light itself). And even though we really really wanted to do more, we decided it was best to limit the scope to rooms we were already working on. So we did shelf a few important items for later. After talking with an electrician, it seemed like it would be fine to wait for now. So, I'm going to keep this short... because I honestly can't remember that many details. We decided to try the all of the work on our own. Despite having an electrician come in and give us a quote, we decided that we could put on hold everything that was way out of our comfort zone..... and attempt just the things only slightly out of our comfort zone. The electrician was super kind though, and gave us a lot of advice that made us feel more comfortable doing it ourselves (perhaps unbeknownst to him). He'll be back someday to fulfill our on hold list, for sure. Hey, want to see some random pictures I took in the process with minor commentary? Great! 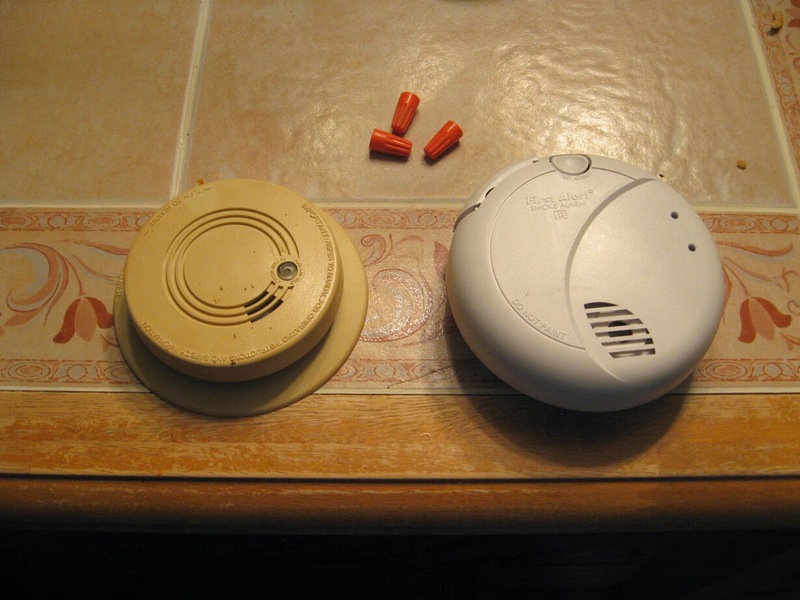 We upgraded our old smoke alarms, that were definitely past the replace every 10 years mark. I'm glad to have not expired alarms... as well as the upgrade from dirty yellow to white. Many of my pictures look like this, or the one at the top. Not really anything for the blog, but record keeping of what we were doing. Plus, the sticking the camera in the wall gave us a lot of direction as to what was happening. By the end of it though, we knew what we were doing without having to refresh ourselves with pictures. Closet hall getting ready for some boxes. So easy to run wires in the open walls. 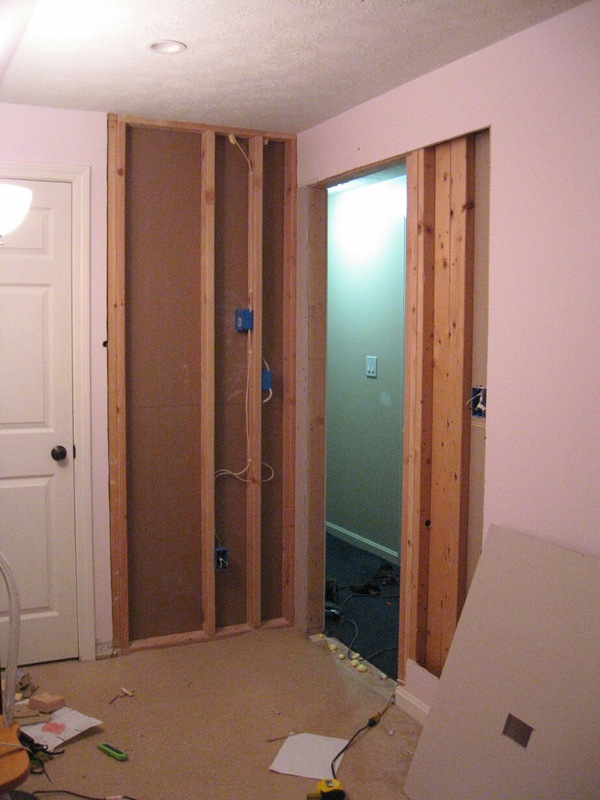 A little harder to remove and run wires in the closed walls. By some miracle though, my arm fits into those tiny holes. 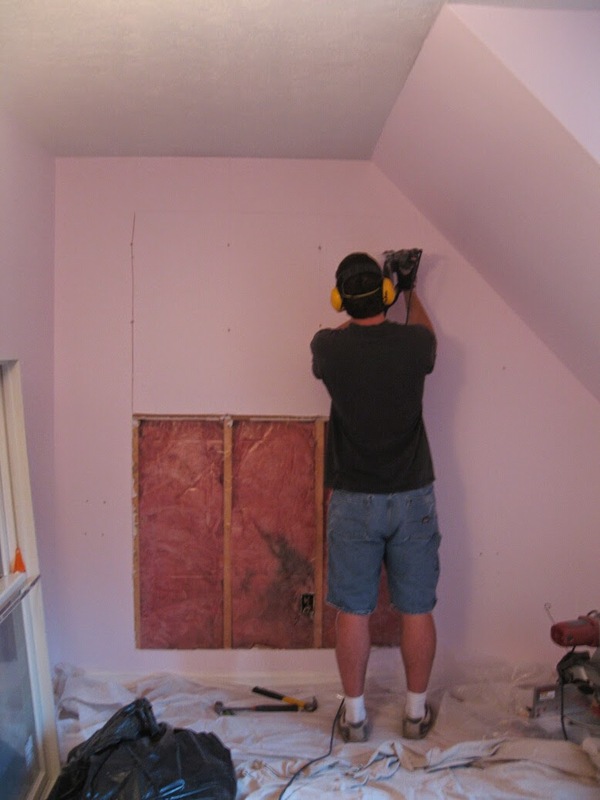 Barely though, and I had lots of drywall cuts by the time I was done. 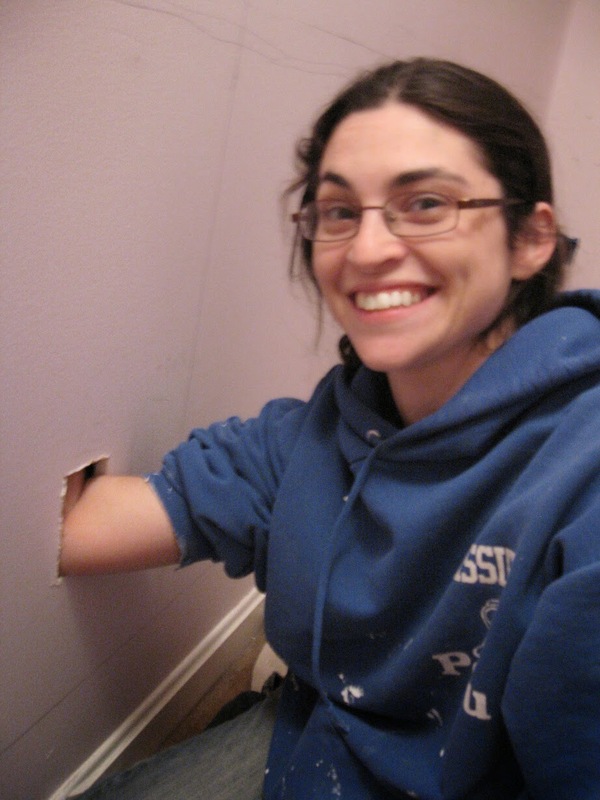 It really saved us some drywall damage where we had to add outlets. Here's just a couple pictures from the recessed lights that honestly, we hadn't even thought of ever doing, until two weeks after the demo. We new we wanted some sort of ceiling light eventually, though. The conversation went something like this. "So.. if we have to install a switch in the new wall, maybe we should put in some ceiling lights now, like we wanted to have someday. 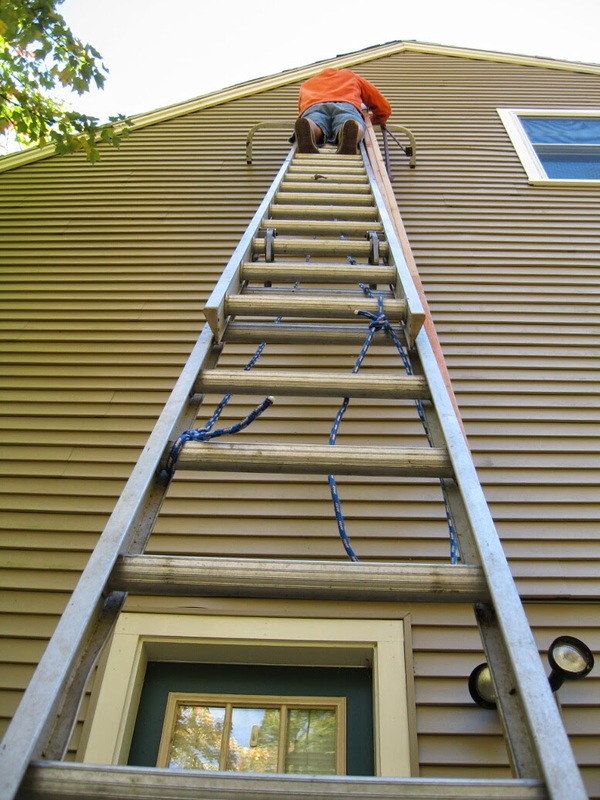 The electrician said if we ever wanted them, now is the time to do it." "Yeah. That makes sense. Where?" "Well.... it would be good to be the center of each of the rooms, but... I don't want to hit a ceiling fixture every time we play Just Dance." 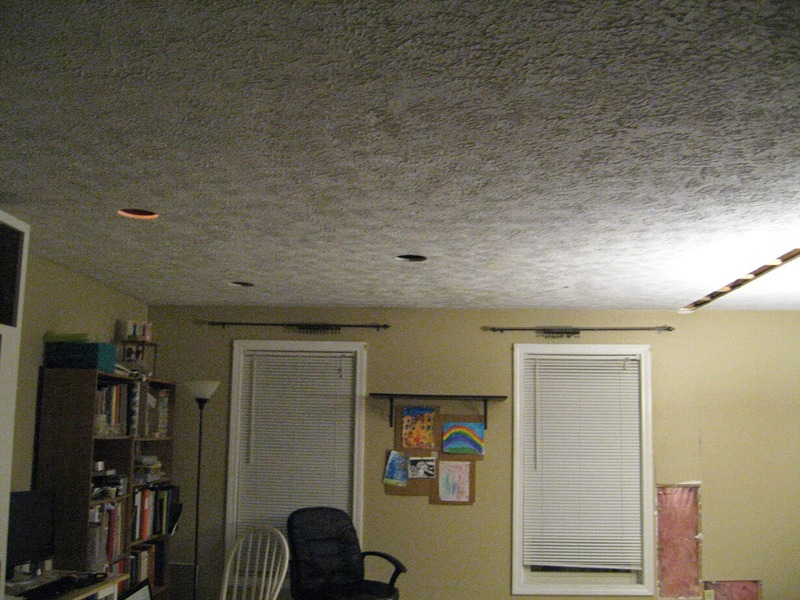 "Think we recessed lights would work?" So the reason we have recessed lights is because we play Just Dance. Whatever. It's our house. Cutting the holes wasn't too bad. Although some idiot (me) mis-measured and one row of lights one side of the room are 3" off. It. may. just. kill. me. 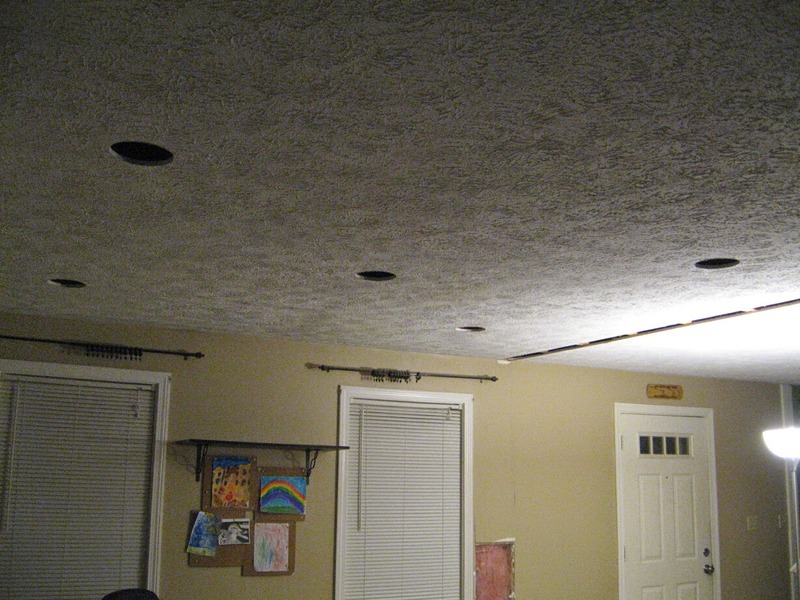 Joking aside, the perfectionist in me will relocate those lights if we ever do get rid of that hideous popcorn ceiling that we both hate. Must not think about those lights. 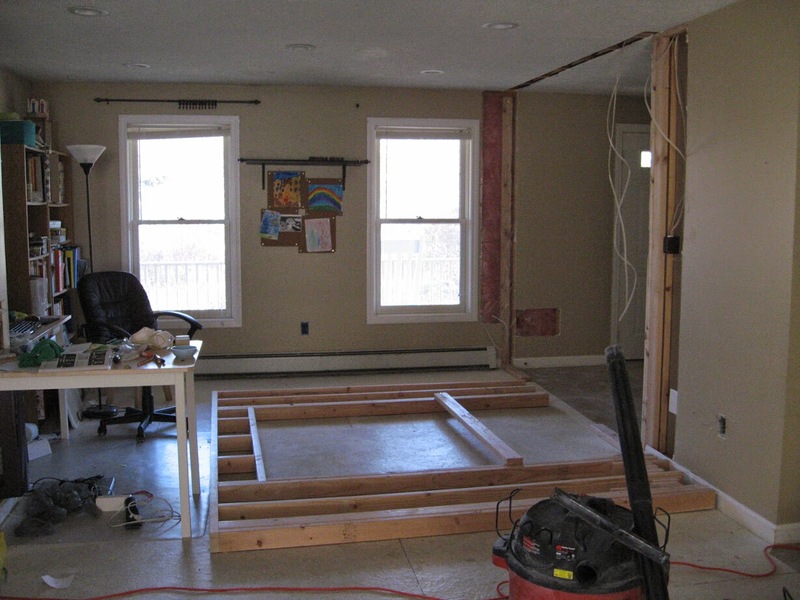 Some where back before we started the electrical work, I framed up the wall that was going in the living room. 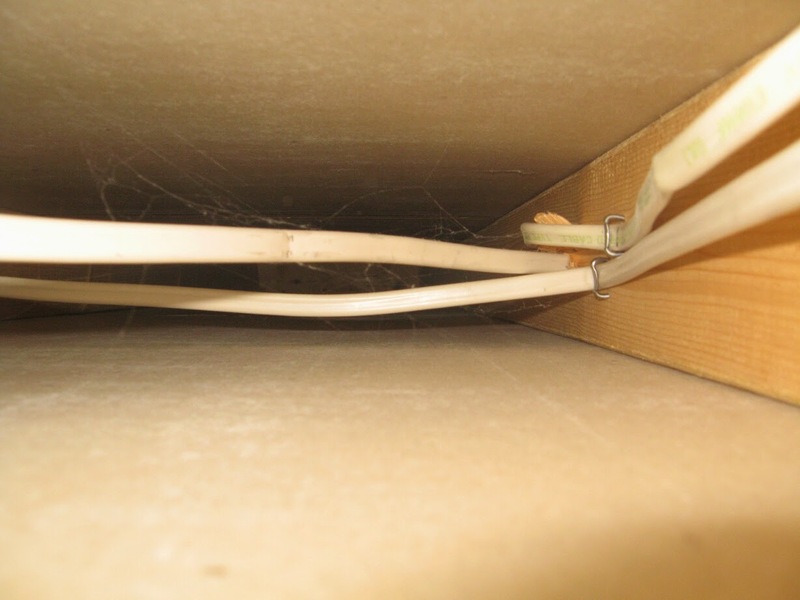 However, it dawned on me that we should use the hole to run the wires before we tipped it up. The electrician heartily agreed. So our new wall sat there on the floor for about three weeks. It's funny how many people actually preferred walking on the boards instead of the floor. Even the electrician paced on them a bit while we were talking. (And needless to say, my kids loved them too). 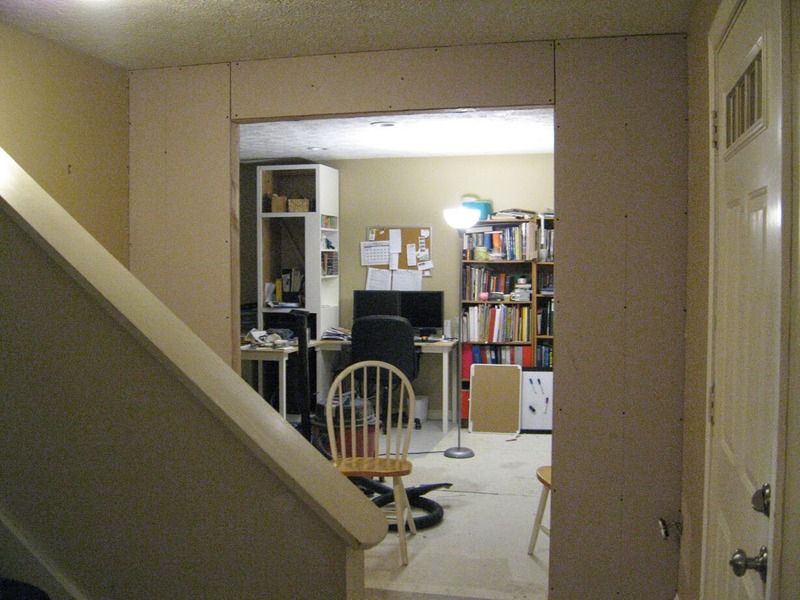 Once the cans were wired, we were finally able to block off that opening in the ceiling with the wall. So wonderful to finally see it in place! So, that's all I really have to show. It's not much. For those not familar with the rough in inspection, it's fairly simple. All boxes in and wires need to be run, stapled and stripped, but with no switches, or outlets on them. 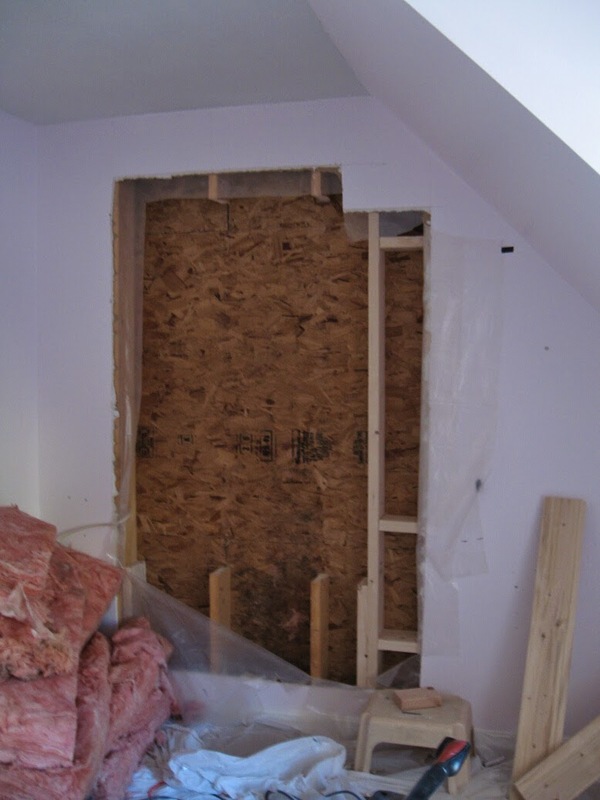 Any new walls have to be exposed (no drywall), as well as new insulation and window flashing. Any retrofit work isn't really checked in detail. ...but we broke the rule a little bit. We were sick of having no ceiling lights in the dining and hall... and we realized that there was only one wire that was impacted by our demo. So just rewired an existing 4-way switch to a 3-way switch as planned... but before the inspection. It was retrofit, anyway, so there wasn't much they would check eitherway. Oh man. Being about to turn on these lights on after being off for 26 days of darkness was amazing. Our hallway and outdoor lights were on that circuit as well, so that was an added bonus to have those back. It was another 19 days after we 'cheated' that we actually had the rough in inspection done... so it was totally worth it. 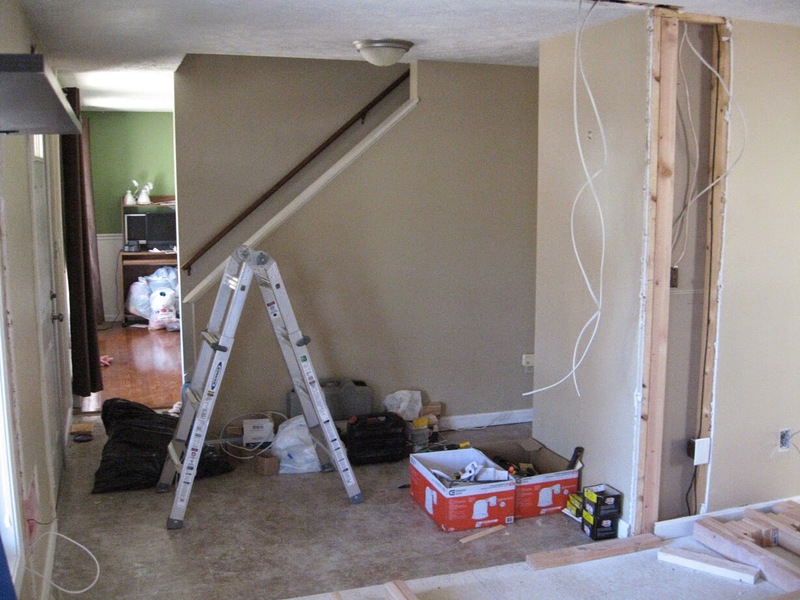 In the last two days we ended up rushing like crazy to get the electrical to a roughed in, inspect-able state... so I don't actually have any pictures that are completed rough-in. We in such a hurry because eWe really wanted to be able to start sealing in the siding around Eve's window thanksgiving break (snow is coming!). I took time of on Thursday morning inspection, which really was our last shot to make our thanksgiving goal. The inspector came... and we passed! We didn't even need an electrician to come bail us out when we got stuck (which was actually part of our plan - try it until we're in over our heads). Felt pretty darn good. I have to say, the Black and Decker book I picked up on a whim when I started this project really, really helped us out on many occasions. The wiring diagrams were wonderful in that book, and really helped us figure out what we had and what we needed. I knew almost nothing about a wiring a house, and now I'm feeling pretty darn confident with the basics. Next up though... siding and drywall! 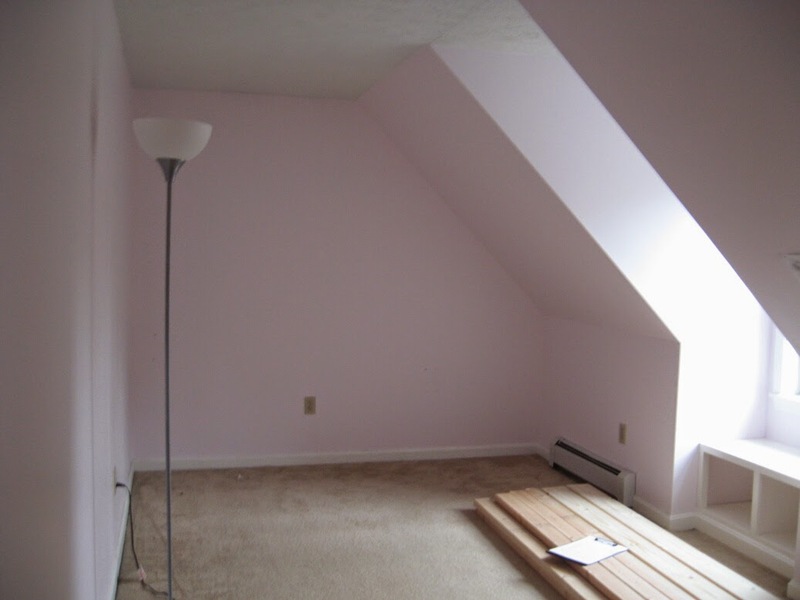 As mentioned in my planning post, we wanted to put a window in the end of Eve's room, because it gets so little light. Well, we have. And even though it's been in for about a month, I'm still surprised at how much light there is every time I walk in there. There's actually been such a hiatus because, well, 1) when there's work to be done I don't post... 2) we're not done yet and 3) we haven't had power in the living room for a while. I'm actually running the computer off the extension cord right now. I'm gong to keep it short, but here's the gist. 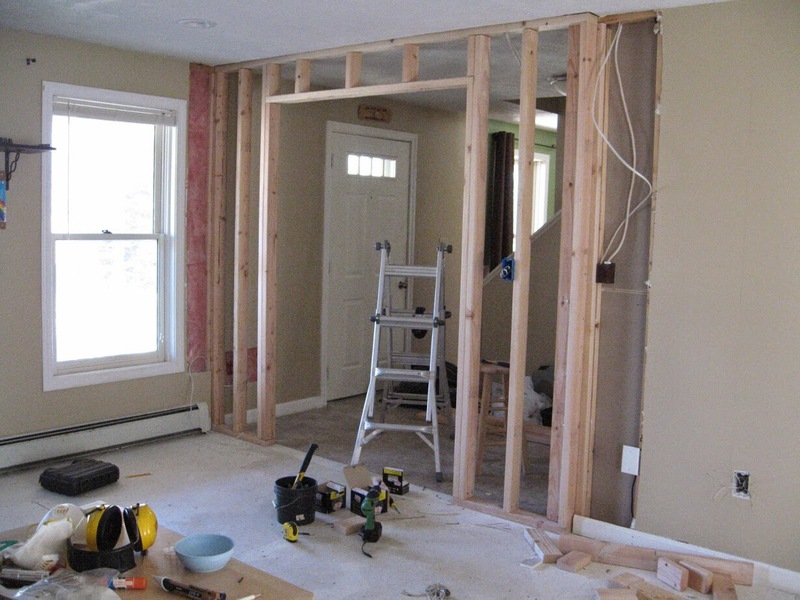 We realized we needed an electrical permit... so we've actually added on a fair amount of electrical work (in the rooms we were already working on) to our other plans. So that's the big reason why this 'simple' project isn't done yet, and why I haven't had any time to post. Enough updates, back to the window. So the process was simple Cut hole. 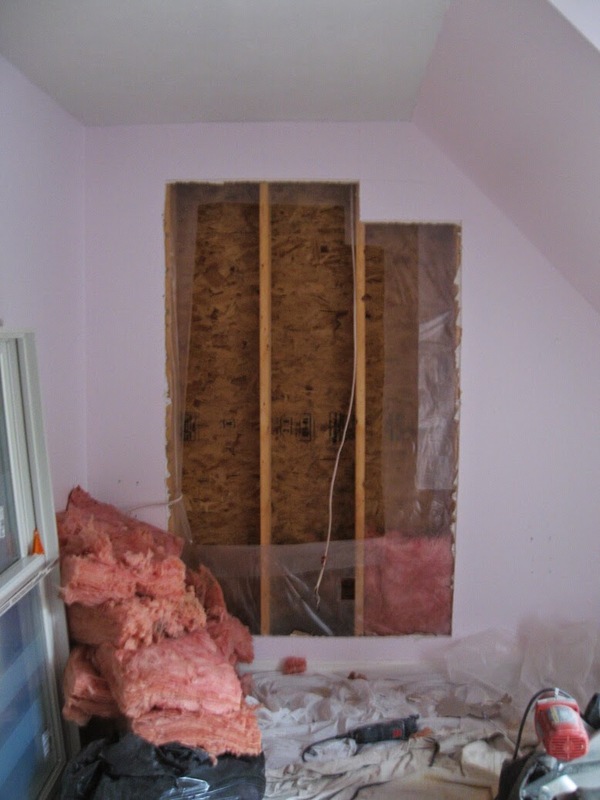 Remove insulation. Move outlet. 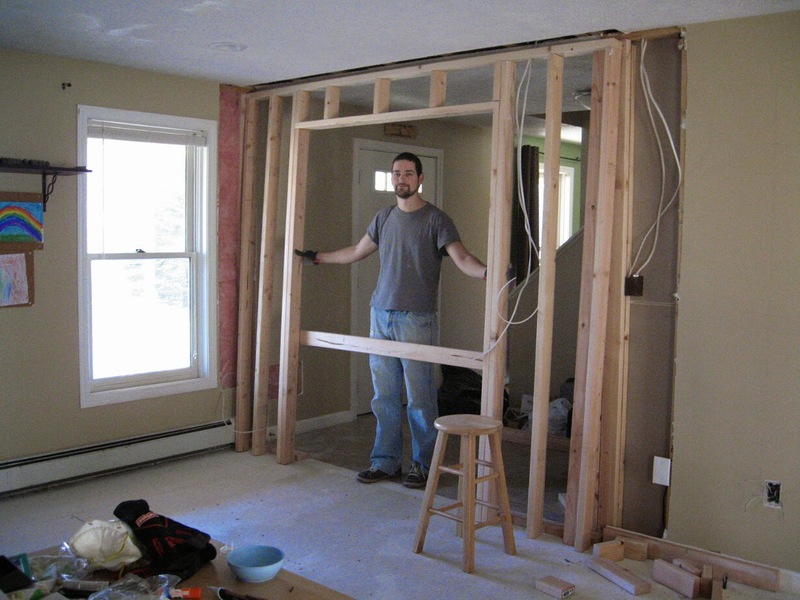 Frame wall. 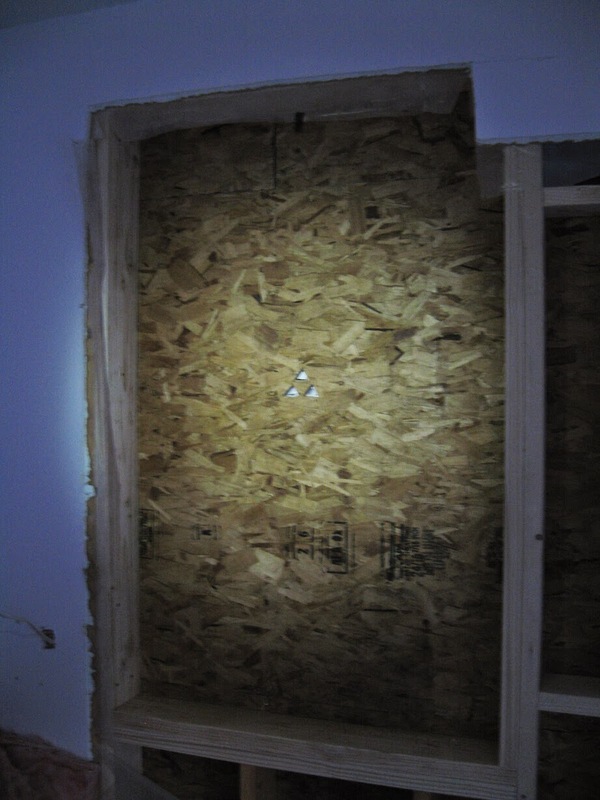 Now it was time to cut a hole in the sheathing and put this guy in it. We were so happy to unbox the window see how big it was (It's actually the same size as the boys one we put in on that same side). It's been hanging out in our basement since we bought the other windows for our house and we cannot wait until there are no more windows in boxes waiting in our basement. As we've done before, we set up the pump jacks. Jon started by digging holes for the bottom of the posts. We saved the platform and poles in our basement from last time, so it was an easy set up. ...besides the whole 'height' thing. 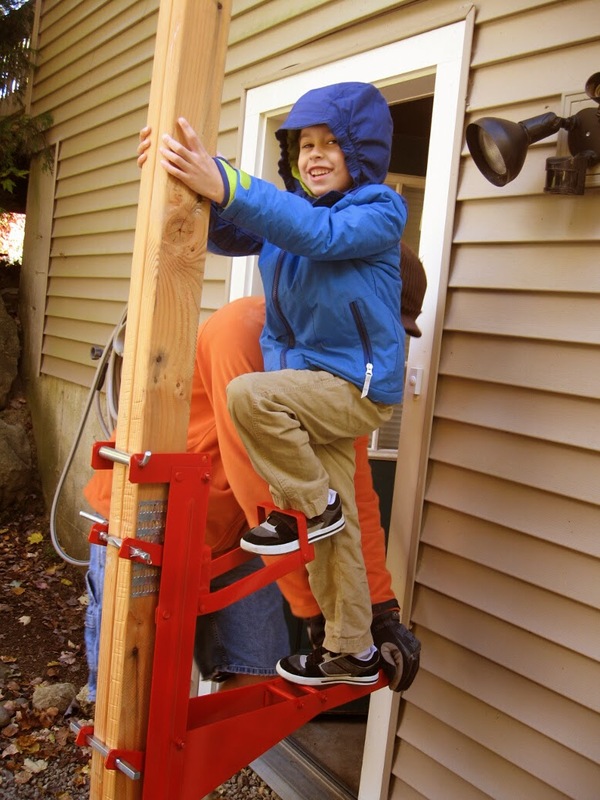 We were able to successfully put the first pole up, and had Eli try it out for us. Not to be outdone by Jon, I put the second pole up. We braced the bottom and got the platform on. Note, we didn't put in the lower set of braces, like we did last time (above the door line). We should have. It make the experience much more stable, and less...harrowing. If you're wondering more about pump jacks, you can check out my post here. We did make a video though, to help clarify how they actually work. We're a little rusty using them right off the bat, but we get there. So there's a little lapse in pictures, but we got the platform up to the top and I pulled siding off while Jon started to cut out the board with our oscillating flush-cut tool. 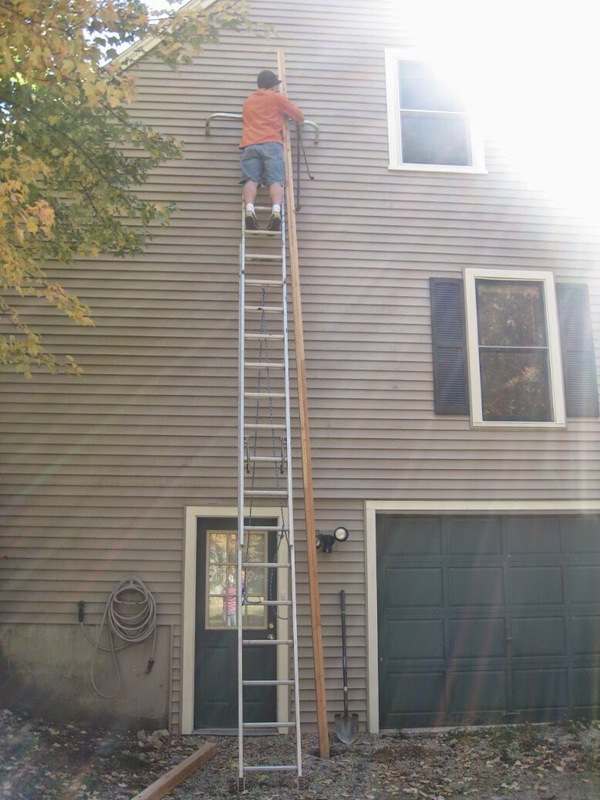 He made sure not to push the tool through until I had the siding off and house wrap removed. In case you're wondering, Jon had driven some nails into each corner so I could find where I needed to remove the housewrap... and so we could hear eachother better he made a small hole ... which I later found out was a tri-force :) Such a gamer. Once Jon got to the last cut, I hopped down, got the kids and we all watched the light come in. Of course it had turned to dusk by the time we had taken the wall out... but the effect was still pretty big. After doing an install this many times, we were able to wrap it up pretty fast. I got the housewrap, flashing and shimming all ready (while Jon made dinner). After we ate, we put the window in. We've found it works best if Jon stays outside and screws it all in, and I stay inside and shim. Movie magic, and it's done. That's pretty much it. Now it has to sit in this state until our rough in inspection. We are loving how much light we get in there.